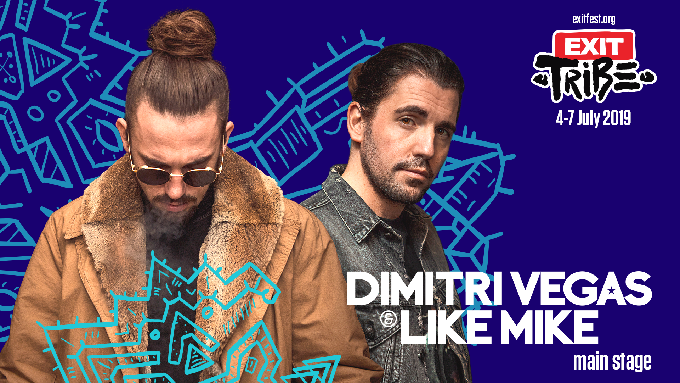 Officially best ranked DJ duo in the world, Dimitri Vegas & Like Mike have confirmed their performance for the Exit’s Main Stage, bringing a new spectacular show on Sunday, July 7! The Belgian duo is returning to the Petrovaradin Fortress after three years, when they put on a show to remember, reaching the full capacity of the mts Dance Arena! Siblings with a Belgian address and Greek origin have been the best ranked DJ duo on the Top 100 DJs list of DJ mag for years now. Their one first place and four second places on the list mean they left behind names such as David Guetta, Tiesto, Hardwell, Calvin Harris and Skrillex! For years they have been residents at the famous Tomorrowland and their performances are considered the pinnacle of this gigantic event, while their show in Germany in front of 45,000 visitors is considered the largest electronic event of the decade! They are also holding records in their native Belgium, where they managed to outsell Madonna and U2 with 60,000 tickets sold in only three days. EXIT’s Main Stage will also welcome the New York tandem rising quickly on the music scene – Sofi Tukker. They have achieved instant success with their “Drinkee” single, launching them straight among the heroes of young generations, with the crown of success being their last year’s Grammy nomination for the best dance track, although they did not even have an EP or album published yet! Like other successful bands from New York, Sofi Tukker have a recognizable and modern sound, in their case inspired by the 90s music, from jungle-pop vibrations, to contagious house, afro and Latino rhythms. They conquered the world overnight with their hit-track “Best Friend”, which, after appearing in the commercial for the megapopular iPhone X, along with being included in the FIFA 18 official soundtrack! The official tourist agency of the festival, exittrip.org will offer tourist packages containing tickets, as well as accommodation and transport options!